WHAT IS AN ALL-IN-ONE POSTER? Private labeled with your Logo, Company Name, Telephone Number and Website. No Minimum Order Quantity Required. Labor Law Posters at publisher direct pricing are used to fuel PosterElite's Retention and Acquisition Solutions. 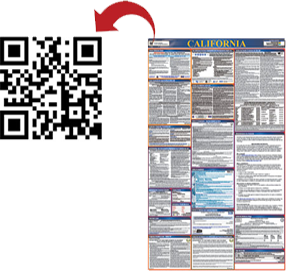 Learn how a free labor law poster can help you maximize client retention. Learn how labor law posters can help you strengthen your referral partnerships and get mores sales leads. Labor Law Postings can change at any time of the year. But how do you know when to replace your labor law poster? Utilize our QR Codes to establish yourself as a subject matter expert on Labor Law Posting changes. Simply scan the QR Code with your smartphone and see if the poster is up-to-date!